It’s sad to say this will be the final blog post of our Whitsunday adventure. I am writing this a full week and a half after arriving back in the Pittwater and maybe I’ve been dragging the heels a bit because it is like signing off that our first adventure is over. In some ways it all feels like a dream from long ago now, it’s amazing how a change of lifestyle makes time seem to have suddenly passed so quickly by. 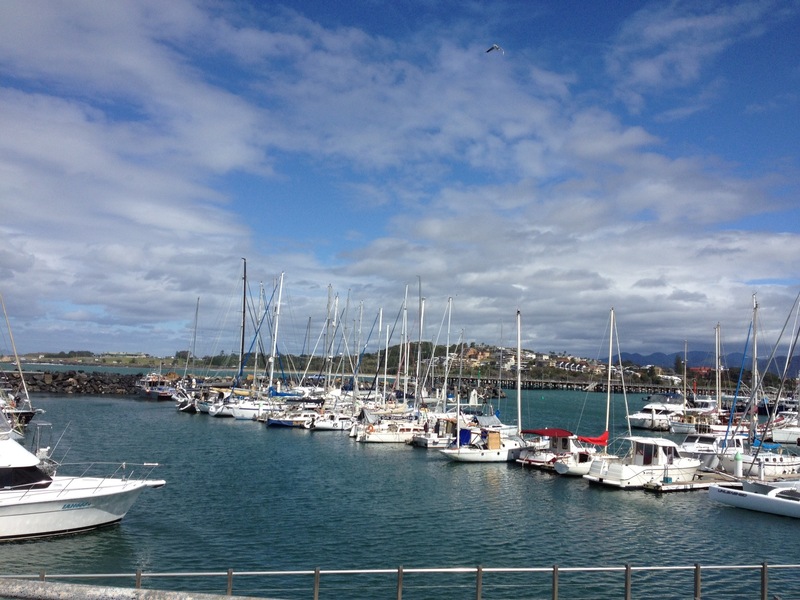 Coffs Harbour was again a very enjoyable place. This time it was a lot friendlier than the huge swells we encountered there on our trip up. We realized that yes, you could actually anchor here in comfort in the right weather conditions, ‘tho we were safely in the marina enjoying the TMM status once again (Tallest Mast in Marina). We spent 2 enjoyable days there waiting for the southerly wind to change to northerly. On the first night we caught up with an old skiff sailing compatriot Evan Beeby and his friend Kirsty, burgers at Attitude burgers which were delicious, finally satisfying a seed that had been planted a few weeks back by young Drew Randall: “I feel like a nice hamburger for dinner!” The girl serving us looked exactly like an older version of Sarah Rodgers, daughter of our good friends Brian and Julie – it was uncanny. The burgers were so good we went back for lunch the next day. On the second night we went over to the yacht club for drinks and happened upon the meat tray draws which Lyn managed to win twice. This continues a long history of Lyn’s luck with meat tray draws and I’m waiting for it to translate to a big Lotto win soon (our retirement plan). Silus loves Coffs, especially the awesome main beach, which is a dog leash free area. If only other councils would follow this lead! We had a lovely trip from Coffs to Newcastle, partly motor-sailing and part downwind with poled out jib. We had a magical encounter with a huge pod of dolphins off Port Stephens before the southerly came through and we motored into it for the last couple of hours to Newcastle. Newcastle is like our second home and so close to Sydney that it really felt like this was our arrival home. 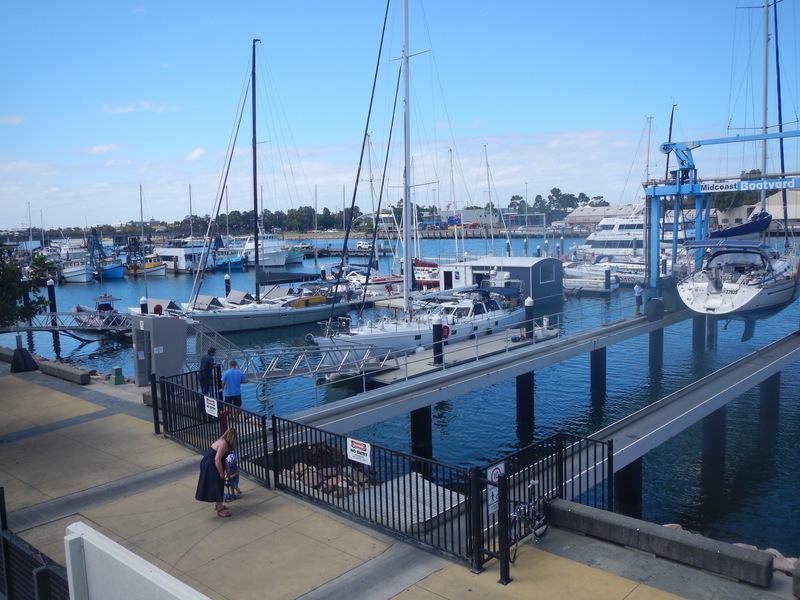 Joey had arranged a berth for us right out the front of the boatyard and the club, what a pleasure, especially when Anthem arrived the next day and was berthed right alongside us. We had a re-union with Chris and Katrina at Joe and Belinda’s place and a good time and drink was had by all! Chris and Katrina caught a cab home and decided they may as well leave the car for us to use whilst we were up there – fantastic! Keith and Merle caught the train down to Sydney to continue their search for a home for when they finally come to Oz permanently early next year. With my work and I deciding that I may as well only start work again Monday week, we were able to enjoy a really cruisy few days in Newcastle, a great way to relax before getting back to the true reality of work and Sydney. Thanks to having the car to use I was able to have a fun kite at Nobby’s beach. The wind was marginal but good enough for the 17 meter kite and I had a few moments skimming over the reef as it sucked dry in the waves but all in all a really fun place for kiting (not for beginners). Adrian (of Anthem) invited us (and Joe and Belinda) to join him, Claire and Laura at their beautiful house in the Maitland (Woodville) countryside for dinner. Mike who has come out from Colorado to sail with Adrian for a while was also there. He’s an interesting man who has lead an extremely adventurous life including a long stint in the Antarctic, rock-climbing all around the world and kiting with skis through the snow. Needless to say, the fine wine flowed freely as we devoured Claire’s delicious curries. By Thursday it was time to leave. The forecast was really good for the trip to Sydney and I was fearful if we stayed for the weekend I would have to once again risk my Laser sailing reputation in the NCYC fleet which is growing ever stronger. We had a wonderful sail down to the Pittwater. No need for the motor and most of the way we had the Gennaker and single reefed main up in about 12 to 18 knots of north-easterly. Nice as it was to have Keith and Merle join us for a while, it was fitting that the final leg be just the two of us. The leg was punctuated by a bit of action as the gennaker furled poorly outside broken bay and we had to take it down in the increasing wind. This was soon sorted and we had the gennaker stashed in the sail locker and headed towards Lyn’s (previously) favourite island Lion Island, sailing beautifully downwind under main and poled out jib. By jolifou in Uncategorized on November 26, 2014 . So sad your blogs have come to an end.It was great experiencing your adventure. There will be many more to come. Thanks for the opportunity to sail with you on beautiful Jolifou. Looking forward to your future blogs. I agree with Joliette that I will buy your book too. Love to the three of you.